To determine the clinical and demographic factors associated with disease remission and drug survival in patients with ankylosing spondylitis (AS) on TNF inhibitors. Data from a longitudinal electronic database of AS patients under anti-TNF therapy between June/2004 and August/2013. Demographic, clinical parameters, disease activity by ASDAS remission (< 1.3) and inactive/low (< 2.1) were analyzed to characterize reasons for drug survival and switching of anti-TNF. Among 117 AS patients, 69 (59%) were prescribed only one anti-TNF, 48 (41%) switched to a second anti-TNF and 13 (11%) to a third anti-TNF. Considering ASDAS-CRP < 1.3, 31 (39%) patients were inactive at the end of the study. Non-switchers (P = 0.04), younger age (P = 0.004), non-smoking (P = 0.016), shorter disease duration (P = 0.047), more frequent use of SSZ (P = 0.037) and lower BASDAI (P = 0.027), BASMI (P = 0.034) and BASFI (P = 0.003) at baseline were associated with remission. In the multivariate analysis younger age (P = 0.016) and lower BASDAI (P = 0.032) remained as remission predictors. This study supports that ASDAS-CRP remission is an achievable goal not only for non-switchers but also for second anti-TNF, particularly in patients with younger age and lower BASDAI at baseline. Co-medication and non-smoker status seems to have a beneficial effect in anti-TNF response in this population. Ankylosing spondylitis (AS), the most frequent disease in the spondyloarthritis (SpA) group, is a chronic rheumatic disorder characterized by inflammatory back pain, peripheral arthritis, enthesitis and extra-articular manifestations such as uveitis and inflammatory bowel disease . Non-steroidal anti-inflammatory drugs (NSAIDs) are the first line drugs in the treatment of AS. Sulfasalazine (SSZ) and in some cases methotrexate (MTX) may be considered in patients with concomitant peripheral arthritis, but there is no evidence of the benefits of disease modifying anti-rheumatic drugs (DMARDs) for the treatment of axial involvement. According to the ASAS recommendations, treatment with anti-TNF drugs is indicated in patients who maintain persistent high disease activity . Drug survival of anti-TNF agents in the long-term follow up is increased in patients with SpA, particularly AS, when compared to rheumatoid arthritis (RA) [3, 4]. In this setting, the identification of predictors of good response is important to optimize therapeutic decisions in AS. Previous studies have already demonstrated that younger age, lower Bath Ankylosing Spondylitis Functional Index (BASFI), increased disease activity with high C reactive protein (CRP) level, and even the presence of HLA-B27, are markers of good response to treatment [5–7]. In case of primary or secondary failure, switching to another anti-TNF is currently the best therapeutic option. Although drug survival with the second anti-TNF is frequently lower than the first one, the clinical improvement with the first switch in AS can vary from 30 to 70% of patients, indicating that the lack or loss of response to a TNF blocker is not a predictor of failure to another one [8–10]. The Danish nationwide biologic registry (DANBIO) documented therapy with anti-TNF drugs in patients with AS and described that almost 30% of the 1436 patients switched to a second and 10% to a third anti-TNF medication during 10 years of follow up; switchers were more frequently women, with shorter disease duration and higher levels of Bath Ankylosing Spondylitis Disease Activity Index (BASDAI), BASFI and visual-analogue-scale (VAS) global at the beginning of the treatment. At the 2-year visit, 52% of switchers (number needed to treat – NNT = 1.9) and 63% of non-switchers (NNT = 1.6) achieved BASDAI 50 response, compared with the baseline visit of the first treatment . There was no strong evidence of difference between switchers for failure or adverse events in relation to baseline characteristics and therapeutic response; however, studies with small group of patients have shown a slightly better response in those that switched due to adverse events than due to failure [12, 13]. Despite the well-known indication of DMARD associated with anti-TNF drugs in the treatment of RA, there is no such consensus in relation to SpA. ASAS recommendations do not support the mandatory use of conventional DMARDs associated with biological therapy, especially in cases of axial involvement . As the formation of anti-drug antibodies is one of the possible mechanisms of lack or loss of blocking TNF response, co-medication with DMARDs has been suggested in many inflammatory diseases, including SpA [14, 15]. In the last decade, many studies have addressed the use of concomitant conventional DMARDs in patients with SpA, with contrasting results. Although two studies each have shown that MTX could be associated with longer anti-TNF drug survival in psoriatic arthritis [16, 17] and AS [18, 19], three other studies showed no benefits of this association [20–22]. Therefore, there is no definitive conclusion on the benefit of combined therapy with anti-TNF and DMARDs considering drug retention and effectiveness. The primary aim of this study was to determine the clinical and demographic factors associated with disease remission and prolonged drug survival in patients with ankylosing spondylitis (AS) on anti-TNF inhibitors. We also evaluated the influence of co-medication in AS patients on anti-TNF switching, clinical response and remission. One hundred seventeen AS patients followed in the Spondyloarthritis Outpatient Clinic and referred to the Immunobiological Drugs Infusion Center (CEDMAC – Centro de Dispensação de Medicação de Alto Custo) with indication of biological therapy for disease activity refractory to conventional treatment were evaluated. Data of patients from an ongoing electronic database protocol that received anti-TNF therapy between June 2004 and August 2013 were retrospectively assessed. All patients fulfilled the modified New York classification criteria for definite AS . Demographic characteristics as gender, age, HLA-B27 positivity, smoking (current or previous), and disease duration were recorded. Assessments also included parameters of previous and current treatment with DMARDs, NSAIDs and prednisone, as well as the presence of peripheral arthritis. Patients were evaluated using an electronic chart database protocol established in 2000 with periodical assessment of parameters of treatment response and adverse events. Acute phase reactants, as CRP and Erythrocyte Sedimentation Rate (ESR) were collected at every visit. Outcome parameters were BASDAI, BASFI, Bath Ankylosing Spondylitis Metrology Index (BASMI), Ankylosing Spondylitis Quality of Life (ASQoL) [24–28]. The analysis of final clinical response was performed in patients receiving anti-TNF therapy at the end of the study. Clinical response was measured according to determined levels of Ankylosing Spondylitis Disease Activity Score (ASDAS) - CRP and ASDAS – ESR  and the Ankylosing Spondylitis Disease Activity Score (ASDAS) update of 2018 was used to classify patients according disease activity states as inactive disease (< 1.3) and low disease activity (1.3–2.1) . Treatment for less than 24 weeks or patients that stopped medication due to drug failure, adverse events or multiple switches (i.e. use of the same drug for more than one course) were excluded only from response analysis, at final evaluation and remission predictors. This study was approved by the Local Ethics Committee on Human Research at the University of São Paulo (CAPPesq). All participants gave written informed consent in compliance with the Helsinki Declaration. The results were presented as mean and standard deviation (SD) for continuous variables (age, disease duration, BASDAI, BASMI, ASQol, ESR, CRP and ASDAS - CRP/ESR) and compared using the T test or Mann-Whitney test when comparing two groups and ANOVA for more than two groups. Categorical variables (gender, HLA-B27, peripheral arthritis, smoking, use of DMARD, NSAID or prednisone, ASDAS – CRP/ESR) were shown as percentage and evaluated through the Fisher Exact Test or Chi square when indicated. Multivariate analysis was also performed for possible factors associated with remission and Kaplan-Meier analysis for drug survival on different anti-TNF courses. Statistical significance was considered when P < 0.05. Statistical analyses were performed using SigmaStat version 3.1 (2005) and GraphPad/ Prisma Software. A total of 117 patients treated with TNF inhibitors were identified. Forty-five patients maintained the first agent during the study period; 48 patients switched to a second anti-TNF, due to failure in 58% and adverse effects in 42% of the cases; and 13 patients were treated with a third anti-TNF, 62% due to failure and 38% due to adverse effects (Fig. 1). The most common first anti-TNF was infliximab in 88 patients (75.2%), with adalimumab in 20 (17.1%) and etanercept in 9 patients (7.7%), indicating the drug availability in our country at that moment. Adalimumab was the most frequently used second drug (67%) and etanercept was the common third line treatment (69%). The median of follow-up duration was 41.5 months (0.5 to 116.1 months). At baseline, demographic data and clinical parameters were similar in switchers and non-switchers (Table 1). There was no difference regarding gender, age, presence of HLA-B27, smoking (current or previous), disease duration and disease parameters. With regard to co-medication, non-switchers used more often DMARD (88.9% vs. 72.9%, P = 0.023); among those patients who used concomitant DMARDs, the use of SSZ was also more frequent in patients who maintained the first treatment (37.7% vs. 18.8%, P = 0.039), whereas no difference was observed when MTX users were analyzed (18.8% vs. 16.7%, P = 0.811). Groups with and without SSZ co-medication presented similar baseline characteristics, as gender (P = 1.000), age (P = 0.869), smoking (P = 0.489), peripheral arthritis (P = 0.839), BASDAI (P = 0.473) and ASDAS-CRP (P = 0.923). The mean dose of SSZ was 2.6 g per day. The concomitant use of conventional DMARDs in the AS patients was quite common due to the high prevalence of peripheral joint involvement (70%) in our patients with axial SpA. Thirty-five patients (29.9%) used more than one DMARD at the introduction of the anti-TNF drug; MTX and SSZ was the main combination. High disease activity was associated with maintenance of combined DMARDs at the study entry as there was no other treatment option at that time. 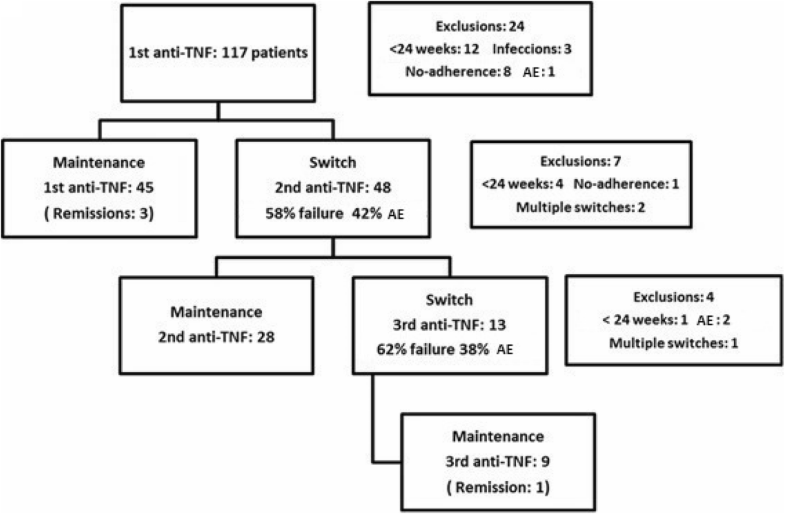 Switchers’ characteristics at baseline of the second anti-TNF were also assessed and compared between patients who remained receiving the second and those who have not responded and switched to the third anti-TNF. Groups were similar with respect to demographic data and characteristics of disease, except for the higher scores of BASDAI at baseline of the 2nd anti-TNF in patients who required the third therapy (6.4 ± 1.7 vs. 4.1 ± 2.5, P = 0.012), suggesting worse disease activity in patients who evolved with failure to the second anti-TNF. The choice of the first switch did not influence the maintenance of the second treatment; it was comparable among patients who started and switched to monoclonal antibody (infliximab or adalimumab) and those who started with monoclonal antibody and switched to etanercept (66% vs. 77%, P = 0.716). At the end of the study, 78 patients (42 non-switchers and 36 switchers) were using their last TNF inhibitors for more than 6 months; among the 36 switchers, 28 patients were receiving the second and 8 patients the third anti-TNF. Table 2 shows the final parameters of disease activity and clinical status. The effectiveness of the first TNF inhibitor was more evident in non-switchers, since this group had at final evaluation lower scores of BASDAI (1.7 ± 1.6 vs. 2.6 ± 2.0, P = 0.041), BASFI (2.8 ± 2.7 vs. 4.2 ± 3.0, P = 0.034), ASDAS - CRP (1.5 ± 0.7 vs. 2.0 ± 1.0, P = 0.012) and ASDAS - ESR (1.3 ± 0.7 vs. 1.8 ± 1.0, P = 0.050) compared to switchers, in spite of comparable duration of the last anti-TNF treatment for the switchers and non-switchers (P = 0.146). Of note, non-switchers more often achieved inactive/low disease activity (ASDAS< 2.1) by ASDAS - CRP (80.1% vs. 55.9%, P = 0.024) and ASDAS - ESR (88.1% vs. 57.6%, P = 0.003) and remission (ASDAS < 1.3) by ASDAS - ESR (61.9% vs. 36.4%, P = 0.037) and ASDAS - CRP (42.8% vs. 26.5%, P = 0.156). Considering ASDAS - CRP < 1.3, 31 (39%) patients were inactive at the end of the study. Thereby the NNT was 5.57 for non-switchers and 5.33 for second and 13 for the third anti-TNF. Switchers due to failure or adverse effects were comparable regarding demographic data and baseline characteristics, as disease activity parameters and co-medication. In the final evaluation, 14 switchers due to adverse effects and 14 patients due to lack or loss of efficacy were on treatment with second anti-TNF. Response to treatment and status of disease were comparable between the groups (ASDAS - CRP < 2.1: 64.3% vs. 66.7%, P = 1.000). Patients that achieved remission at the final evaluation with ASDAS-CRP < 1.3 were evaluated for the presence of predictors of remission at baseline. Younger age (32.3 ± 9.9 vs. 39.8 ± 11.8 years, P = 0.004), non-smoking (smoking: 16.0% vs. 46.3%, P = 0.016), shorter disease duration (10.6 ± 9.3 vs. 14.7 ± 9.8 years, P = 0.047), more frequent use of SSZ (70.9% vs. 44.9%, P = 0.037), lower BASDAI (4.6 ± 2.2 vs. 5.8 ± 2.0, P = 0.027), lower BASFI (4.4 ± 2.0 vs. 6.2 ± 2.5, P = 0.003) and lower BASMI (3.6 ± 2.8 vs. 5.0 ± 2.7, P = 0.034) at the moment of anti-TNF drug introduction were associated with remission (Table 3). Of note, 71% of the patients that achieved remission remained in the first anti-TNF and none achieved remission in the third anti-TNF. In the multivariate analysis the variables that remained as predictor of remission were younger age (OR = 0.935; CI 95% 0.886–0.987; P = 0.016) and lower BASDAI (OR = 0.725; CI 95% 0.541–0.972; P = 0.032) (Table 4). Further analysis of significant parameters in univariate demonstrated that patients treated with SSZ and anti-TNF achieved more often at the end of the study inactive disease (ASDAS-CRP < 1.3, 47.7% vs. 25.0%, P = 0.040) and lower disease activity according to ASDAS – CRP (1.5 ± 0.9 vs. 1.9 ± 0.9, P = 0.009) than patients without this co-medication. Non-smokers AS patients also achieved remission more frequently than smoker patients (ASDAS-CRP < 1.3, 48.8% vs. 17.4%, P = 0.016) and seemed to present lower disease activity (ASDAS-CRP, 1.5 ± 0.8 vs. 1.9 ± 0.8, P = 0.056) at the end of the study. The mean anti-TNF drug survival for non-switchers was 5.2 years (95% CI 4.4 to 6.0 years) and for switchers was 1.7 years (95% CI 1.3 to 2.1 years) on first anti-TNF, 4.9 years (95% CI 3.9 to 5.9 years) on second anti-TNF and 3.8 years (95% CI 2.5 to 5.2 years) on third anti-TNF. Retention to therapy was superior for non-switchers when compared to switchers to the second (log rank test P = 0.007) and to the third anti-TNF (log rank test P = 0.02). The retention to therapy between switchers on the second or third course presented no difference (log rank test P = 0.07) (Fig. 2). This is the first long-term study to evaluate AS patients under anti-TNF agents focusing on ASDAS inactive disease, demonstrating an overall 40% remission. We further identified that younger age and lower BASDAI at baseline were predictors of long-term remission. 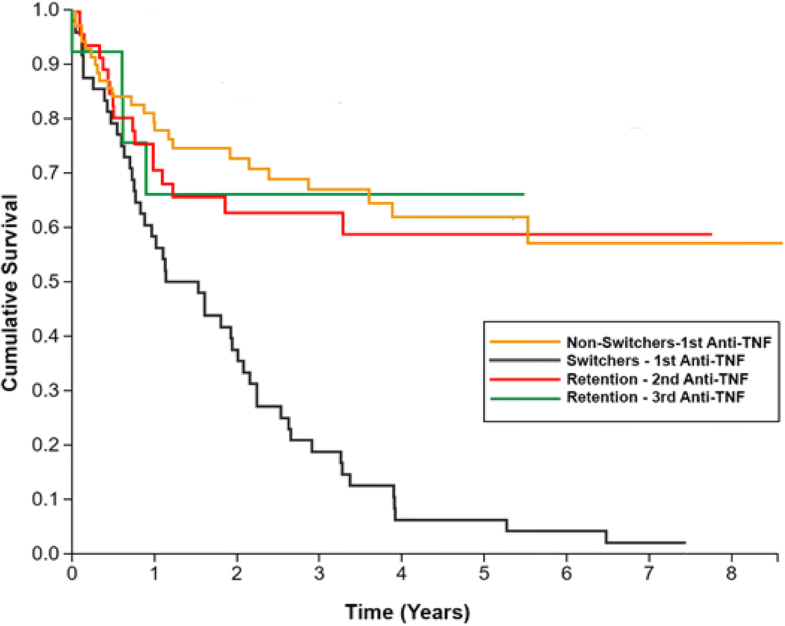 Switching was a frequent event during long-term anti-TNF therapy in our cohort, occurring in more than a third of our patients and mainly due to treatment failure (lack or loss of efficacy). In the Danish registry (DANBIO) , and in a Dutch  and a Spanish  cohort a high frequency of switching was also observed, mostly associated with lack/loss of effect. In contrast, in the Norwegian registry (NOR-DMARD)  and in the Leeds cohort  a very low frequency of switching/ discontinuation was reported. We have not identified demographic and baseline disease parameters as relevant predictive factors for switching in our patients opposing to previous report that female gender, MTX use, higher BASFI and BASDAI were associated with the second anti-TNF therapy . Although a previous report has shown that peripheral involvement was a predictive factor of switching , it was not observed in this study, probably because that represents a common finding in Brazilian axial SpA patients . With regard to the third anti-TNF, we identified that patients with higher BASDAI at the time of introduction of the second anti-TNF agent were more likely to switch to the third TNF inhibitor, suggesting a refractory disease in these patients. Although response rates decreased after switching for the second anti-TNF agent, many patients presented satisfactory improvement in the follow-up with a NNT very similar to the first anti-TNF agent. In contrast, the very high NNT for the third TNF blockers and complete absence of remission in this group does not support this switch. At the final evaluation, non-switchers achieved lower levels of BASDAI, BASFI and ASDAS-CRP compared to switchers. Similar trends of reduced response in switchers have been demonstrated [9, 11, 34], but none of these studies considered ASDAS inactive disease as a target. In fact, ASDAS is the only validated and discriminatory instrument for assessing disease activity in AS [29, 30]. The reason for change (lack/loss of efficacy or adverse events) to the second TNF antagonist did not influence anti-TNF response. At the final assessment, both groups presented comparable indexes, including BASDAI, ASDAS-CRP and frequency of ASDAS inactivity/moderate disease activity. Previous studies reported similar results [10, 11, 35, 36]; however, some demonstrated slightly better clinical improvement in switchers due to adverse events [11, 34]. In this study, we presented novel evidence of predictive factors considering ASDAS score as remission criteria. Unlike other studies that considered BASDAI50 or ASAS40 (4–6), ours considered ASDAS-CRP < 1.3 as remission response. Younger age, non-smoking, shorter disease duration, more frequent use of SSZ, lower BASDAI, BASFI and BASMI at the time of anti-TNF drug introduction were identified as possible predictors of remission and only younger age and lower BASDAI at baseline remained significant in the multivariate analysis. Taking into account that ASDAS considers 3 answers of BASDAI questionnaire plus global assessment of disease and CRP or ESR parameters, we consider that baseline ASDAS index may not have been associated with remission due to similar values of CRP and ESR at baseline between the groups and limited number of patients with ASDAS evaluation at baseline in our cohort, since ASDAS index was published in 2009. We suggested and extended recent observations that concomitant DMARD use was associated with a better first anti-TNF persistent rate [19, 20, 37]. The non-exclusion of patients who discontinued without switching anti-TNF due to other causes precludes a definitive conclusion about concomitant DMARD use effectiveness in AS in a previous study . Non-smokers AS patients also achieved remission more frequently than smoker patients at the end of the study, in agreement to published data. Previous studies indicate that this factor has a dose-dependent impact on structural damage progression and in worse treatment response of SpA patients [38–41]. The treatment response analysis performed herein was limited to patients under anti-TNF treatment at the final evaluation and with at least 24 weeks of therapy. This strict study design provided novel data demonstrating that SSZ co-medication was more often associated with remission. In the Swiss cohort, a benefit in drug survival was reported, but it was only demonstrated for DMARD on the clinical response in patients treated with infliximab and methotrexate . Baseline disease and activity parameters were alike in patients with and without SSZ minimizing the chance that these factors might have influenced SSZ effect in anti-TNF treatment. In fact, more than 2/3 of our patients have associated peripheral involvement in AS, and the concomitant use of conventional DMARD, as SSZ, is quite common in our daily practice in Brazil [42–44]. This long-term longitudinal study supports that ASDAS-CRP remission is an achievable goal not only for non-switchers but also for the second anti-TNF, particularly in patients with younger age and lower BASDAI at baseline therapy. Co-medication and non-smoker status seems to have a beneficial effect on anti-TNF response in this population. This work was supported by grants from Fundação de Amparo à Pesquisa do Estado de São Paulo (FAPESP #2015/03756–4 to EB), Conselho Nacional de Desenvolvimento Cientifico e Tecnológico (#305068/2014–8 to EB) and the Frederico Foundation (to PDSB, EB and CGSS). The datasets generated and / or analyzed during the current study are not publicly available because they belong to electronic database of the institution but are available from the corresponding author on reasonable request. AYS: study concept and design, assist in subject recruitment, acquisition of subject and data, interpretation of data and drafting the manuscript. CRG: study concept and design, assist in subject recruitment, interpretation of data and revising the manuscript. JCBM: assist in subject recruitment, interpretation of data and revising the manuscript. MGW: assist in subject recruitment and revising the manuscript. ACMR: assist in subject recruitment, interpretation of data and revising the manuscript. PDS: study concept and design, assist in subject recruitment, interpretation of data and drafting the manuscript. CGS: assist in subject recruitment, acquisition of data and revising the manuscript. EB: study concept and design, interpretation of data and drafting the manuscript. CGSS: study concept and design, assist in subject recruitment, interpretation of data and drafting the manuscript. All authors read and approved the final manuscript.